Speech recognition has become a popular requested feature as of recently. 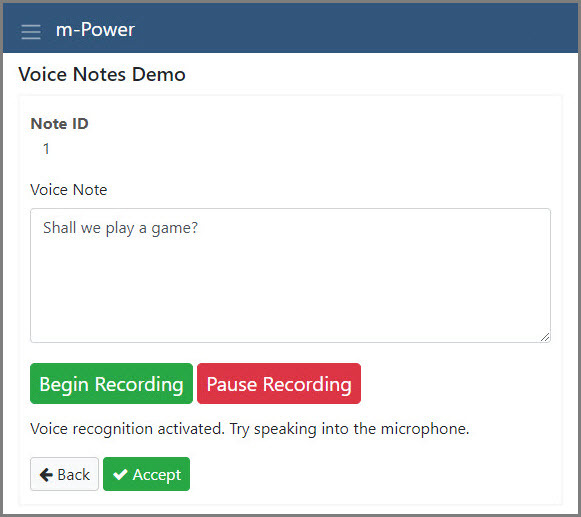 This tutorial will walk you through how to use Web Speech API for allowing access to your device’s microphone to dictate text into an input field. Important Notes: These instructions are only supported in Chrome. Additionally, the Web Speech API is only supported over HTTPS. Be sure you’re installed SSL on your m-Power server. Finally, due to privacy concerns the API requires the end user to allow browser access to the device microphone before the logic will function. To begin, download the required speech-text files and install the folder on your m-Power server. I placed mine in /mrcjava/mrcclasses. Open m-Painter for your maintainer page and insert the external link to the new ‘speech-text.css’ stylesheet in the head section of your HTML. You will also need to insert the external script link to the ‘speech-text.js’ file at the bottom of the HTML, directly above the ‘mpowerapps.js’ link. That’s it! 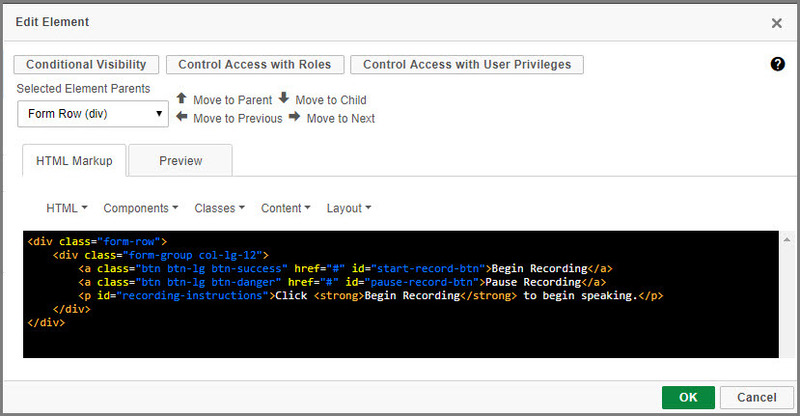 You can now run your maintainer and click the ‘Begin Recording’ button. Once you allow the browser to access your microphone, you may begin dictating text to your input. Are you using a Chrome browser? These instruction are written for Chrome support only. Are you working over an SSL connection? The Web Speech API is only supported over HTTPS. Have you allowed browser access to the device microphone? You should be prompted to allow access the first time attempting to use the feature.